Help us provide the resources, programs and staff your library needs. Our patron donations are vital to Whelden Memorial Library's success. Shop on Amazon? 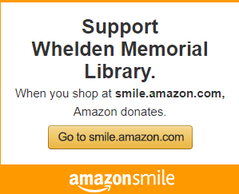 Now Amazon will give .5% of your purchase total to Whelden! Just use Amazon Smile from now on! Help support your local library. Click "Donate" to use your credit or debit card to make a donation using PayPal. On the next screen you will be required to log-in to your PayPal account.